We still have a freezer full of birthday volcano cake from my son’s party. You can’t make a volcano out of just a little bit of cake and he didn’t want me to throw it away. Unfortunately (fortunately? ), we are all birthday caked out so there it sits. We still wanted a dessert for our cookout the other day and my boys had seen a picture of a Boston Cream Pie along with another of a Washington Cake in one of my cookbooks. They called out the description of the Washington Cake to me. I was told it was just cake, jelly, and powdered sugar. That sounded light enough after all the birthday cake last month, so I whipped one up for our bbq. Before posting it, I wanted to do some research to see what the history behind this cake and its name is. It seems that it is named for good ol’ George, but I couldn’t find any details. Also, there are so many different versions that sound nothing like the simple cake I had made. Here is how I made mine. I just threw together a basic yellow cake batter using my aunt’s method for making Red Velvet Cake. 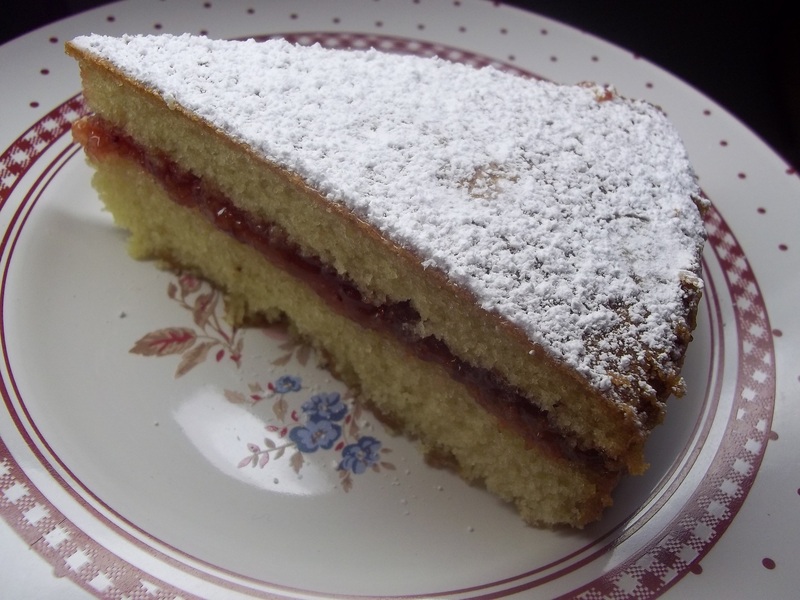 It made a nice, spongy cake. The finished product ended up reminding me of a giant “Eat Me” cake from Alice and Wonderland. We all thought it would have been great with tea, but the lemonade from our bbq is what we used to wash it down. Heat oven to 350 degrees. Grease and flour a 9″ round cake pan. Beat in eggs. Add vanilla, mixing well to combine. Sift together dry ingredients. Mix dry ingredients alternately with milk into creamed mixture until well-combined. Pour into prepared pan. Bake 25 to 30 minutes or until knife or toothpick inserted into center comes out clean. Allow to cool in pan for 10 minutes. Invert onto cooling racks to cool completely. Slice in half horizontally to make two layers. Place bottom layer on a cake plate or stand. Spread bottom layer with the strawberry preserves. Place top layer over preserves and dust generously with confectioner’s sugar. Note: You could double the cake batter to make a thicker, two layer cake if you like. YUM!!! Gotta try this one!!! I have some Strawberry preserves I made last year OH this will be good!